There are all kinds of friends in life and when you are into food like we are some of the best are your dining buddies; you go to every new place with them, get terribly drunk at your regular haunts with them and suggest places you MUST eat at, around town and interstate, when not dining with them. Mr O. as he loves to be called on this blog is one of those friends, and a place he would often wax lyrical about was The Town Mouse. 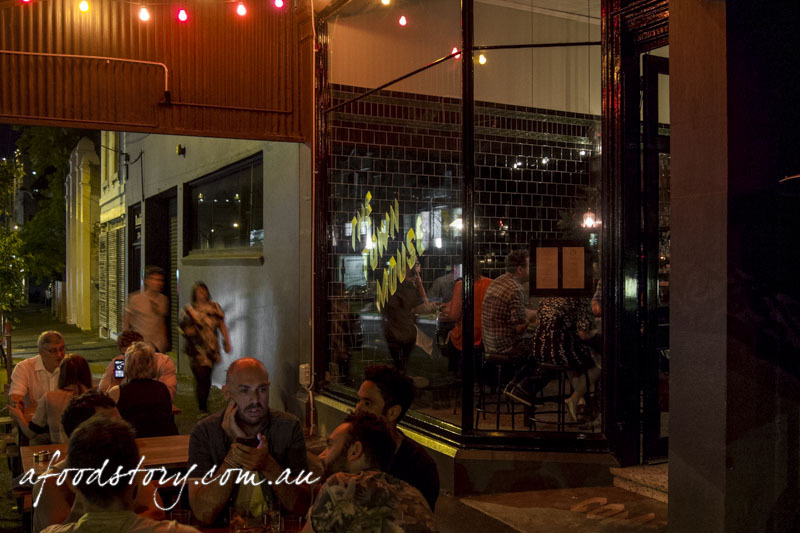 I think he may be more of a regular in some Melbourne joints than I am in ANY Sydney restaurant, but his suggestions are always on point and when he says we MUST go somewhere, we listen. 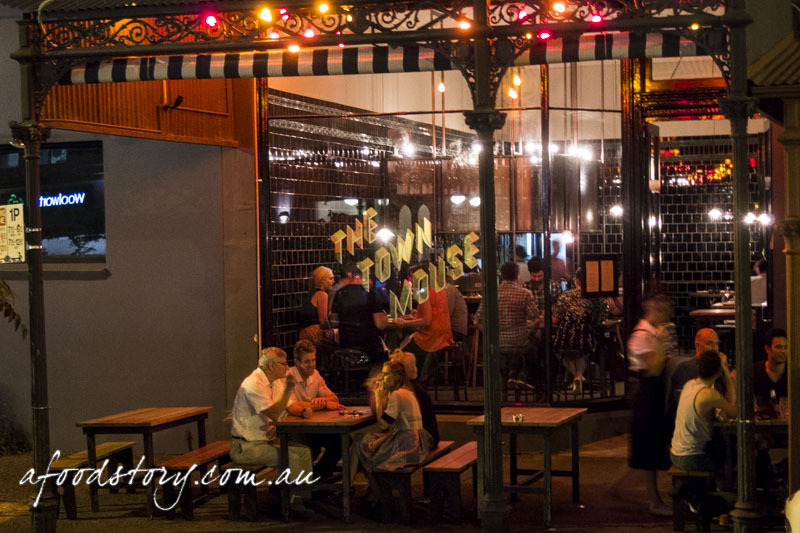 When it comes to booking at The Town Mouse (which isn’t a necessity as they have many tables set aside for walk-ins, but when travelling from interstate you don’t want to risk missing out) you can choose to sit at a table or at the bar. As we only locked in our trip at short notice all that was available was a spot at the bar. Mr. O only ever sits at the bar so it can’t be all that bad. Perched up on bar stools that felt a tad too small, right in the middle of the bar we got to work checking out if the dishes that had been suggested were still on offer. Thankfully the lion’s share of big hitters were available so it was time to begin. Smoked duck liver parfait, pickled cucumber & crisp potato ($3.50). With the menu split into concise sections we began at the beginning in the aptly named section TO START. Duck liver parfait may well be one of the best things on the planet, but smoking something so decadent cranks it up that little bit further. 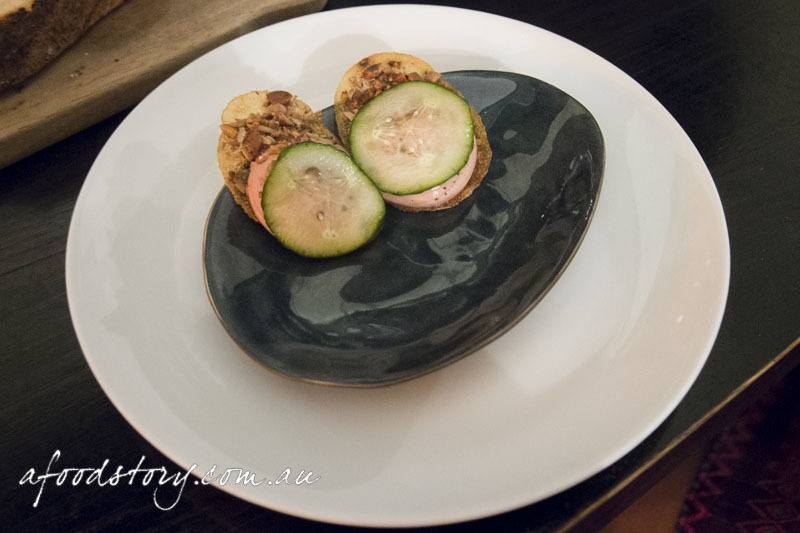 There was level upon level of awesome going on in this little starter, smoky rich creamy parfait, lightly pickled cucumber that retained its crispness and a mix of toasted nuts all layered onto a wafer-thin crisped slice of potato, it was out of this world amazing. Goat’s cheese profiterole, caraway, thyme & our honey ($3.50). 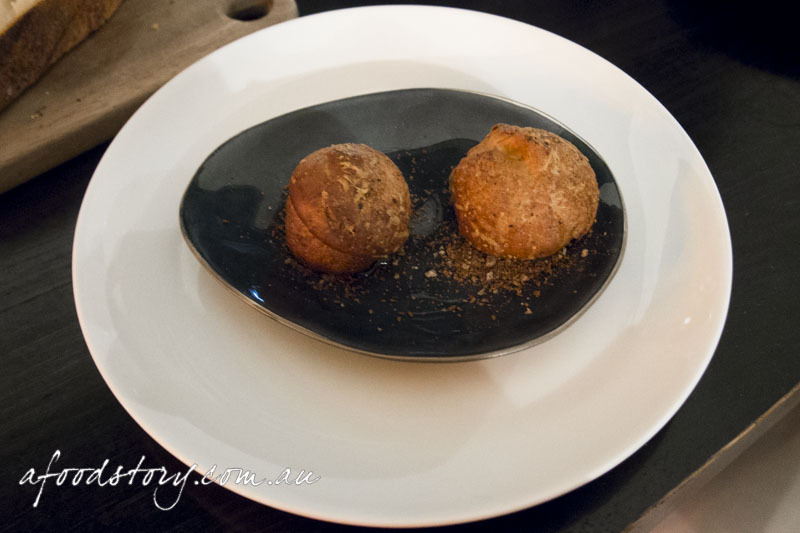 In the same way that any liver parfait draws us in, goat’s cheese tends to do the same, so it was a given that we were going to order their little puffs of choux pastry piped full of goat’s cheese goodness. Glued to the plate with honey sourced from the hive on their roof, sprinklings of caraway and thyme all combined for a welcome change from a sweet profiterole. Creamy, salty and wonderfully tart the goat’s cheese mousse was great and the classic combination with honey made for a light treat. 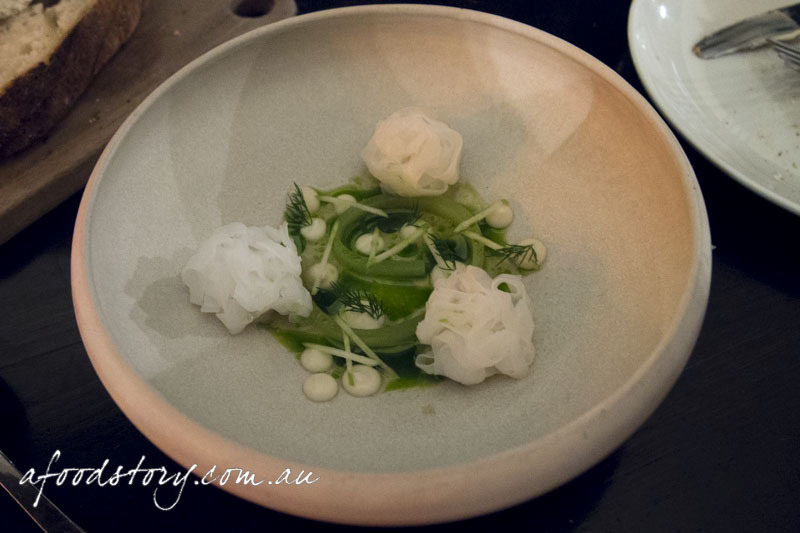 Shaved calamari, oyster cream, dill & fermented apple juice ($15.00). Moving into the RAW section saw the calamari dish ordered and when it arrived it really surprised with how elegant it looked, so much precision and delicate work had gone into the plate it was a shame we had to mess it all up. Like wisps of sea air the meticulously shaved calamari had been cooked sous vide and added an essence of the ocean but it was the little dollops of oyster cream that brought the seafood feel to the dish. Mini matchsticks of green apple contrasted the fermented apple juice and much the same with dill fronds bright and fresh to go with the dill oil swirling about. A single ‘noodle’ of salted cucumber added that final touch to really make this a superbly put together dish. 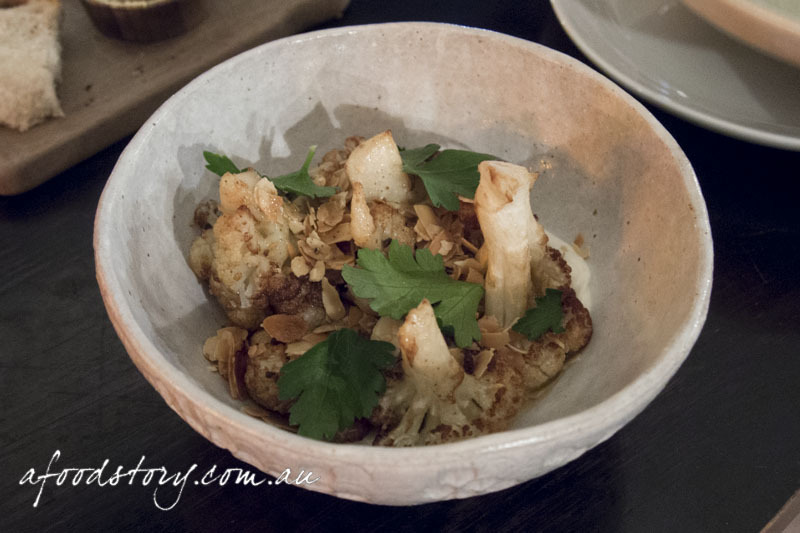 Caramelised cauliflower, yoghurt, lemon & vadouvan ($11.00). One of the many recommendations we had been given was the cauliflower, it was our only pick from the VEGETABLES section because we were told it was the best cauliflower dish ever created. Supremely caramelised there was not a single overly burnt part anywhere to be seen just dark golden edges bursting with flavour. Adding to the roasted nature of the dish were hits from cumin, fenugreek and mustard coming from the vadouvan with some toasted almond flakes for good measure. To counter the spices was lemon and yoghurt in the base of the bowl and to finish a scattering of parsley. I loved every bit of it and all the textures at play. It was great but not quite the best ever. Smoked pork jowl, hispi cabbage, hazelnut & sour pear ($24.00). Getting near the pointy end of the menu MEAT & FISH feature in all their glory. 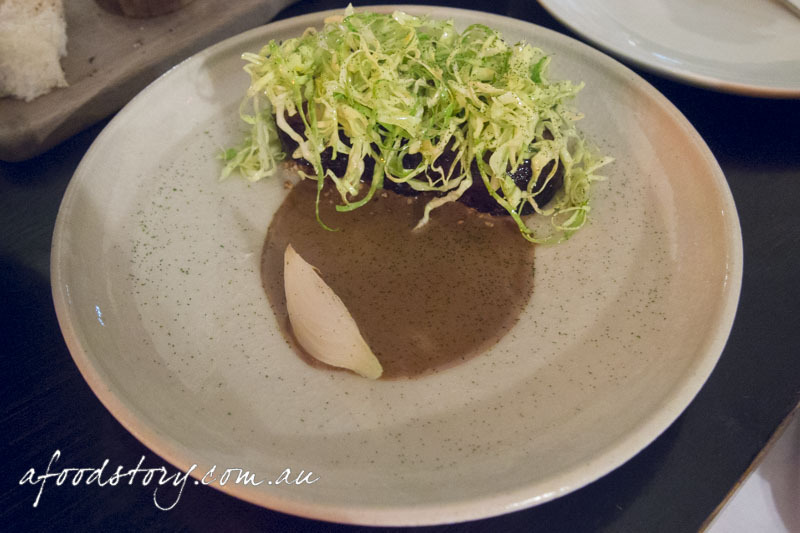 Yet another recommendation had us go for the smoked pork jowl, ruling out the duck and black angus for mains. I love pork jowl, it’s fatty, juicy and just all kinds of happy on a plate; my all-time favourite version being Quay’s rendition sitting under a maltose crackling. Smoking meats can dry them out and ruin it or – as was the case here – lift them to immeasurable heights. Although quite heavy on the smoke the richness of the jowl was able to handle it, and when combined with a touch of sour pear or even a sliver of pickled onion a balance was met that I thoroughly enjoyed. Buttermilk poached pear, walnut, caramel, roast chocolate & pear sorbet ($15.00). It was time for DESSERT. There was one dish that Lex wanted to order above any other – the buttermilk poached pear. For me I had no idea about this dish prior to our visit and Lex only wanted it having seen it pop up on social media. Neither of us knew it had been featured on MasterChef until our waiter told us about its popularity post stardom and how it was to come off the menu finally. This night was the last it was to be on the menu, Lex’s stars had aligned, she would get her wish of trying this dish. Pear desserts are my kind of thing; often less sweet than other fruit desserts and they have such a unique texture and clean precise flavour. Beautiful in presentation fine slivers of pear skin were draped over the pear sorbet and together they wowed with perfect and differing tones of pear. Piped around the sorbet was the incredible roast white chocolate ganache that was sweet but not overpoweringly so, and hiding below the ring the poached pieces done so in buttermilk made for a smoother than raw pear texture while retaining some bite, with the poaching imparting a faint but very much desired milky essence. Salted caramel just boosted everything and the walnuts – done three ways: toasted, crumbed and as a praline – all varied greatly in feel and taste. So many elements that mesh together spectacularly well and we felt privileged to try it on its final night. 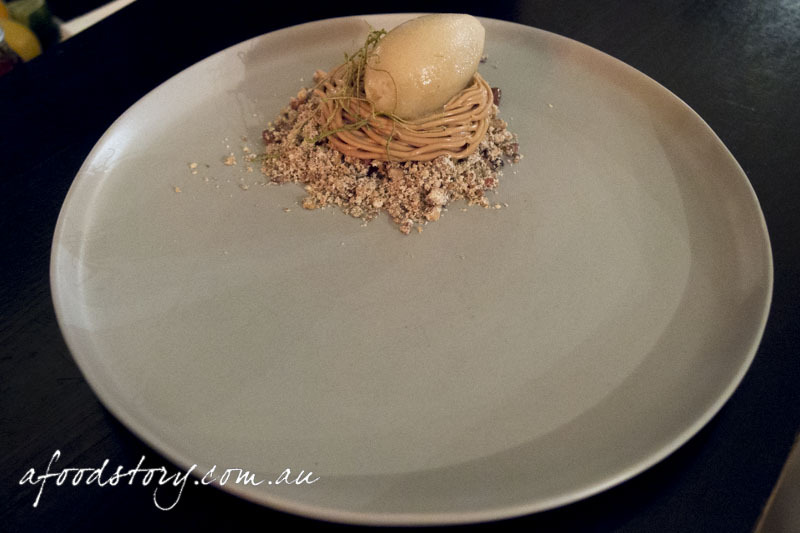 Elderflower sherbet, rosemary & vermouth ($6.00). To counter whatever level of sweetness the pear dish would bring I felt like something super light and refreshing, and hence was suggested the elderflower sherbet by our waiter. When it arrived I almost mistook it for mashed potato but closer inspection showed it to be the dessert we had ordered. 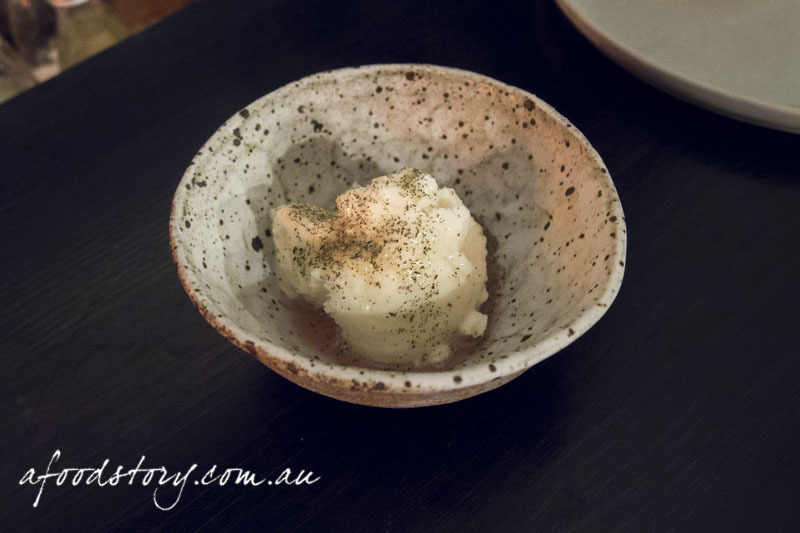 Floral and sweet the elderflower sherbet was light and delicately creamy and the sweet vermouth worked surprisingly well at giving the whole dessert added sweetness and some herbal spicy tones to go with the finely ground rosemary. Happily this did exactly what I had hoped and allowed me to finish on a refreshing note. After a little over 90 minutes eating away and sipping on wine the bar stools had definitely taken their toll with quite a case of numb bum setting in. That being said it was such a great place to be for the duration of our meal, it was super cool chatting away to the staff as they worked their magic behind the bar and bringing out our dishes. They offered great wine pairing suggestions, were impressively knowledgeable about the menu as well as how much to order. We will definitely be heading back next time we are in town. We may go with a larger group and book a table so we can chillax a bit more and take up a little more space, but most likely it will be with Mr. O and the three of us will be back up at the bar enjoying every single second of it.